How to improve information literacy competency? How to prevent computer viruses in our networked world? In the dynamic and interactive academic learning environment, students are required to have qualified information literacy competencies while critically reviewing print and electronic information. However, many undergraduates encounter difficulties in searching peer-reviewed information resources. 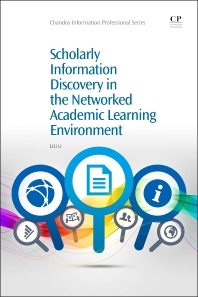 Scholarly Information Discovery in the Networked Academic Learning Environment is a practical guide for students determined to improve their academic performance and career development in the digital age. Also written with academic instructors and librarians in mind who need to show their students how to access and search academic information resources and services, the book serves as a reference to promote information literacy instructions. This title consists of four parts, with chapters on the search for online and printed information via current academic information resources and services: part one examines understanding information and information literacy; part two looks at academic information delivery in the networked world; part three covers searching for information in the academic learning environment; and part four discusses searching and utilizing needed information in the future in order to be more successful beyond the academic world.